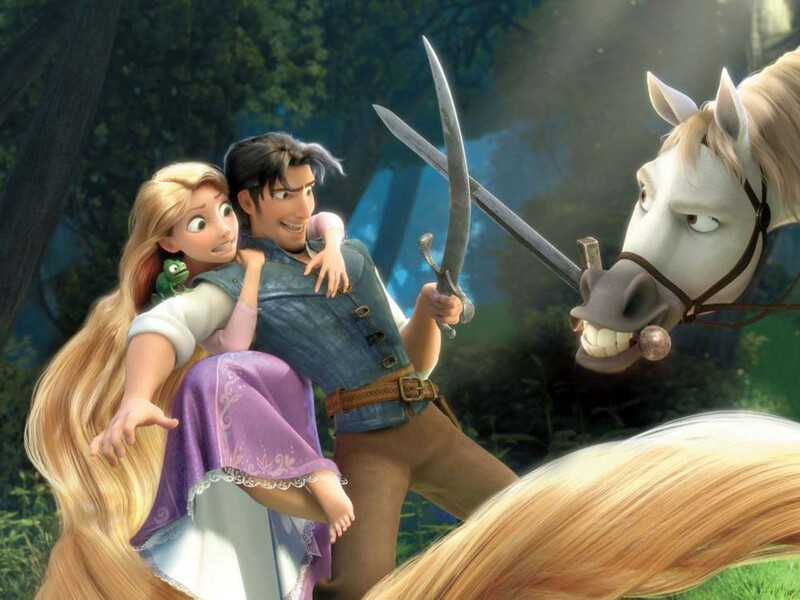 One had to wonder — I certainly did — how Disney came to be telling a Rapunzel story. The original girl with the fantastically long and strong golden hair of folklore was no kind of royalty, after all, and it’s inescapable that Disney’s fortunes these days lie in all things pink-and-princess-y. I should have trusted, because Tangled is, it turns out, ripe with that old Disney magic. I wasn’t immediately won over, though. As the story opens, Rapunzel is prisoner in the traditional tall tower in the woods, being raised by a woman, Gothel, whom Rapunzel believes to be her mother. But Gothel actually kidnapped Rapunzel from the royal palace when she was an infant, the better to make use of her magic blond hair, which has the power to heal and to make the old — such as Gothel — young again. These major changes from the classic story work delightfully well, lending a fresh sort of folklorish import. (Kudos to screenwriter Dan Fogelman.) But initially, Rapunzel herself (voiced by Mandy Moore) feels like a cookie-cutter character singing an insipid show tune about how she’s waiting for her life to begin. The sneak-thief Flynn Rider (voiced by Zachary Levi) climbs Rapunzel’s tower one day when Mama is out and hides from the palace guards. Meet-cute ensues, and Rapunzel convinces Flynn to take her along for her first real foray into the outside world. And that’s when Tangled starts to soar. For a bit, it’s all the hilarious secondary characters who entertain so deliciously, like the ruffians in a roadside tavern who bust unexpectedly into heartfelt song like something out of Monty Python. And then there are the animated sequences, created under the guidance of directors Nathan Greno and Byron Howard: spectacular in their ambition and luscious in illustrating reality in ways both realistic and magical. The power of the animation here to wrap visual gorgeousness and authentic emotion does, at last, come together in Rapunzel and Flynn, who start to open up into people of unexpected depth. By the time their quest reaches its conclusion, we’ve taken a deeply affecting journey that is both unusual in its nature and grounded in the authority of folklore. The poignancy in Tangled will sneak up on you: I didn’t realize I’d been so won over till I was sobbing with joy.